Anna Maria Island Wedding Festival was a big success! The 3rd Annual Anna Maria Island Wedding Festival had lots of brides and grooms enjoying our gorgeous Florida weather. They met with Leslie & many other wedding vendors all in one day! They visited first hand: spas, photographers, venues, caterers, florists, DJ’s, hair and make-up professionals and many more vendors who help make wedding dreams come true. Over $10,000 in prizes – Visions Unlimited / Beautiful Videos is donated several $100 gift certificates for the gift baskets which were given away at a “Mock Wedding” at the Sandbar during sunset (where I shot a real wedding video Saturday night). I hope we saw you there and that you won one of my gift certificates! Transportation was be provided, and brides & grooms enjoyed free trolley rides from the AMI Chamber of Commerce parking lot to The Man Cave at the Community Center, the Sun House Restaurant, The Loft, Body and Sol Spa & Wellness, Haley’s Hotel and many other great wedding vendors. Check in was at the AMI Chamber parking lot (you saw 2 big white tents), and could leave your car behind. You could bring your bikes & enjoy the day while getting fit! Couples enjoyed touring the island with other brides and grooms, visiting venues and wedding vendors there. Thank you for visiting me at Aqua Aveda Salon & Spa! It was great to meet so many wonderful brides-to-be and their handsome fiances. I enjoyed showing you my sample wedding videos and getting your feedback. If you’d like to know more about videography, I’m only a phone call away: 941/315-3456. Call any time. I’m here for you. One Response to Anna Maria Island Wedding Festival was a big success! 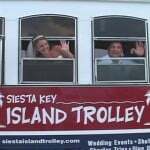 Super Anna Maria Island Wedding Fest for 2010! We are located on Anna Maria Island and known for wines that taste great.